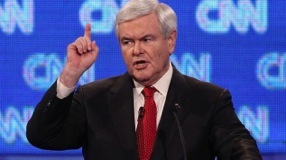 Old canceled Crossfire gives way to Newt version this fall on CNN. As if we already didn’t have enough polarizing partisanship. The granddaddy of cable’s verbal shootouts, Crossfire, is being resurrected by CNN and will return this fall with Newt Gingrich as one of the four regular hosts. 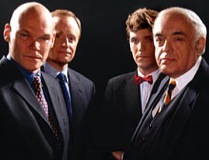 The original Crossfire premiered in 1982 and ran until 2005. Tom Braden and Pat Buchanan initially battled “from the left” and “from the right” before Robert Novak, James Carville, Tucker Carlson and Paul Begala took turns presiding in later years. Two guests also were usually included on a show characterized by high decibel levels and frequent interruptions. Gingrich, the former Speak of the House and presidential candidate, will be joined by conservative columnist S.E. Cupp, Rebuild the Dream president Van Jones and Stephanie Cutter, who was President Obama’s deputy campaign manager during his 2012 re-election campaign. The announcement of Crossfire’s cancellation came in January 2005, just three months after Stewart’s appearance. The last half-hour aired on June 3, 2005. CNN executive vice president Ken Jantz says the new Crossfire will be “the next step in reinvigorating our lineup of live programs” following the recent launches of The Lead with Jake Tapper, Around the World and New Day. All three programs have been birthed under the regime of Zucker, who became CNN’s bossman late last year after serving as president and CEO of NBC Universal and executive producer of Katie Couric’s syndicated Katie during its first year.